View of “Fearful Symmetry,” 2013. Borrowing its title from William Blake’s poem “The Tyger” (“What immortal hand or eye / Could frame thy fearful symmetry?”), this exhibition, deftly curated by Zoe Stillpass, argues that symmetry—a metonym for beauty in Western culture since classical antiquity—is less interesting than the unpredictable, asymmetrical forms released by its dissolution. The key to this thesis is Gabriel Orozco’s small photo From Roof to Roof, 1993, which watches over the show’s main room. The photo offers an oblique aerial view of a pool of water that has collected on the rooftop of a low, flat building; the water reflects a clouded sky and a few barren trees, but is disturbed by two overlapping sets of circular ripples. If Orozco’s work in general is preoccupied with bilateral symmetry (a form of which appears here in the correspondence between sky and water), the photo’s ripples point toward the show’s own preoccupation with those “fearful” moments in which symmetry is breached, unleashing new forms. Beneath Orozco’s photo is Chadwick Rantanen’s Bins, 2013, a collection of four plastic storage bins half-filled with water that have been coated with a wispy film of red ink. Transferred from a camouflage print, the ink dissipates over time, obscuring the pattern that was its source. In subjecting a pictorial field to the material forces of entropy, Rantanen’s work suggests that alongside Orozco, Robert Smithson may also preside over this exhibition. That said, natural phenomena are not the only forces shattering symmetry here. 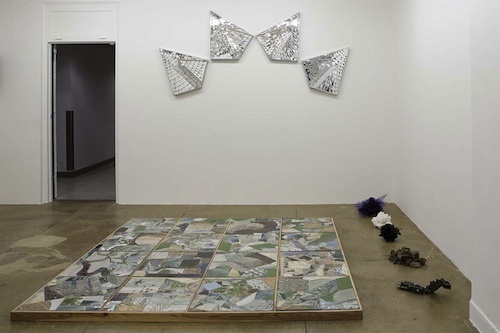 We also see calculated formal manipulations, as in Joel Otterson’s The Garden Floor, 2012, which shows what a floor piece by Carl Andre would look like through the lens of 1970s Pattern and Decoration (and craft): a four-by-four square grid that dissolves into pottery shards of myriad colors and shapes. Either way, this show insists on the formal dividends—even pleasures—that result from the corrosion of rigid forms.